This class represents the notion of a declared variable. Each variable in the program has a SgInitializedName object which represents its definition. A SgVariableDeclaration for example might contain several SgInitializedName objects, while the SgInitializedName contains the declaration for one variable. Each variable use (VarRefExp for example) must have a link to the SgInitializedName object where that specific variable was defined. the variable name which represents the variable that is being declared in this class. Definition at line 86714 of file Cxx_Grammar.h. Allocates a new storage modifier and sets the storage modifier to default values. This is the copy constructor. Returns the name with appropriate qualified names representing nested scopes. User interface for retrieving the associated symbol. It searches through the possible chain of prev_decl_item. Definition at line 86734 of file Cxx_Grammar.h. Register names (x86 specific GNU names). used to represent an unrecognized register. Definition at line 86749 of file Cxx_Grammar.h. Definition at line 86811 of file Cxx_Grammar.h. It clones the current SgInitializedName object recursively or not, depending on the argument. help - If this argument is of type SgTreeCopy, then the SgInitializedName is cloned recursively. 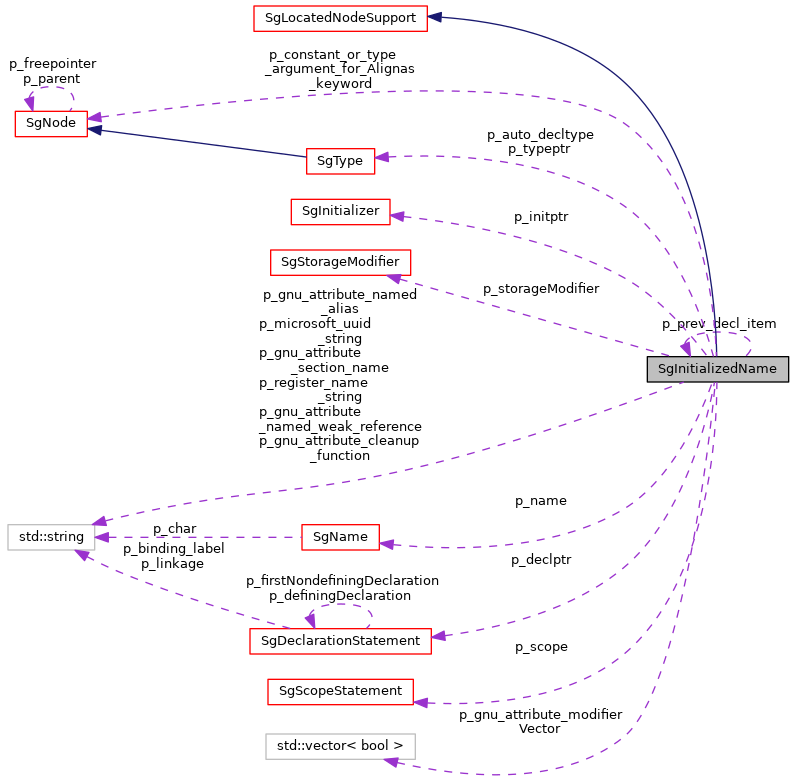 If it's of type SgShallowCopy only the first level of SgInitializedName is copied, everything else pointing to the the original SgInitializedName object's data members. It copies all the data members of the rhs SgInitializedName object to the lhs (this) object. The copying is done by value, so all the data member pointers are copied by value. After the assignment operator is executed, both operands share the same data members. Actually there is a note in the source code (Cxx_Grammar.h) that says that this needs to be executed recursively ( allocating new data members for the newly assigned object). Equal operator : it checks if all the data members are the same or point to the same objects. What really happens It returns false all the time. Get the associated SgSymbol from the symbol table located in the scope, without considering possible prev_decl_item. Internal use only. Users should use search_for_symbol_from_symbol_table() instead. FOR INTERNAL USE Get the associated symbol from the symbol table in the stored scope. Users should use the SgInitializedName::search_for_symbol_from_symbol_table() instead. The variable that is declared in this declaration. This is a SgName object which represents the variable that is being declared in this SgInitializedName object. For example, if there is a "int x" declaration in the code, "x" is the variable that will be stored in SgInitializedName::p_name as a SgName object. Definition at line 87716 of file Cxx_Grammar.h. Pointer to a type object that has been associated with SgInitializedName::p_name. This is a pointer that points to an SgType object that represents the type the variable SgInitializedName::p_name declared in this SgInitializedName class (in this declaration). For example, if the variable is of type "int" (as in "int x"), then a SgTypeInt object has to be allocated , and a pointer to this SgTypeInt object has to be stored in SgInitializedName::p_typeptr to represent the type of SgInitializedName::p_name. Definition at line 87724 of file Cxx_Grammar.h. Pointer to an initializer for the variable. In the case that the declaration contains an initializer for the variable, for example "int x=5" or "int x=y" (in these cases the intializers for the declared variable are "5" and "y"), that initializer has to be stored in SgInitializedName::p_initptr as a pointer that points to the SgInitializer object that the SgInitializedName::p_name variable is initialized with. Definition at line 87728 of file Cxx_Grammar.h. Pointer to the initial uses of this variable previous to its redeclaration declaration. Definition at line 87732 of file Cxx_Grammar.h. flag to determine whether the declaration has an initializer. If the declaration has an initializer, for example "int x=5", then this flag is set to true. The flag is set to false otherwise. Definition at line 87736 of file Cxx_Grammar.h. Pointer to the declaration object where this SgInitializedName object belongs to. Each SgInitializedName object contains the declaration of one variable. In the case where the code has more declarations in a single statement, for example "int x=5,y=3;", that declaration is composed of two SgInitializedName objects, one for each variable declared in that statment. So, this SgInitializedName::p_declptr points to the statement (actually the declaration - SgDeclaration) that contains it. For the first SgInitializedName, this points to the the SgDeclarationStatement that contains this SgInitializedName. For the second one, it is set to an unknown SgDeclarationStatement that does not show up in the pdf or the dot files (not traversed). This points to the SgVariableDefinition and is the same as get_definition(). Definition at line 87740 of file Cxx_Grammar.h. This is the storage modifier (static, auto, register, mutable, asm, etc.). This is the storage modifier (static, auto, register, mutable, asm, etc. ), see complete list in source code for more details. This is an implementation of the modifier system as outlined in appendix A of Bjarne's book. Definition at line 87744 of file Cxx_Grammar.h. This pointer is always valid and stores the current scope of the variable. This is the current scope of the variable (required because variables can be defined separately from their declaration). See test2004_133.C (approx). Definition at line 87748 of file Cxx_Grammar.h. This data member stores an enum value. This value is set based on an enum value to indicate the type of use of the initialized name (valid values are: virtual base class, non-virtual base, data member). Definition at line 87752 of file Cxx_Grammar.h. Code (following GNU standard) for register name. This value is set based on an enum value of GNU standard codes mappings to register names. Definition at line 87760 of file Cxx_Grammar.h.